So, you know how my life here in Le Petit Village can be a little strange? Well check this out; last night The Husband phoned me on his way home from work (all normal so far, he always does) and tells me that Brother-in-Law just dug up some old bones. Huh? What? So not normal. So not only is Brother-in-Law restoring the outside of the Priory, but he's smoothing the surface of the small, medieval cemetery. And that's how he found the bones (say it with me... C R E E P Y). Now immediately upon The Husband's arrival home last night, and finding out what actually happened, as in Brother-in-Law actually found some medieval bones, my nerdy little mind went into overdrive as I pictured National Geographic descending upon us, and the fame that would follow, which would then enable me to begin the annual Medieval Knights Fair that Le Petit Village is destined to host, but now it would be the World Famous Medieval Knights Fair hosted by yours truly, as I reign in my pink satin cone hat with the silk scarf flowing from it's tip, with Fifty next to me in a little monk habit (sometimes my brain wanders). But no, it was not to be, there was no one to call. Apparently, some French historical society was here years ago, found all the remains, and left them (As it should be really, I mean I don't want somebody digging me up 900 years from now... note to self: cremation). No fanfare. No Medieval Knights Fair. Nothing. Boo. (Note to Historical Society: next time you may want to rebury the bones a tad deeper). Looks like somebody found himself a new girlfriend. P.S. Brother-in-Law reburied the remains and I said a little prayer. I've already got Nazi Ghost Zombies on my back, I really don't need some Medieval Banshee chasing after me too. you have a cone hat too. if indiana can find some, so can you. Jenkies! My writer's brain just went into overdrive! He reburied them, damn! I wanna come see!! SO AWESOME! I really need to visit when I am in France next year...check out these Nazi Ghost Zombies! Could you do the costume anyway? I think I might pay to see that! And those bones...spooky and cool at the same time. Have a great weekend Sara. Any brains? Or had the Nazi zombies already taken them? Braaaaains. Promise me you won't shave Fifty's head if you should ever put him in a monk's costume. Wow, I´m thinking Poltergeist! There´s a cementery?! The Priory remembers me a similar ruins on top of Saignon village! 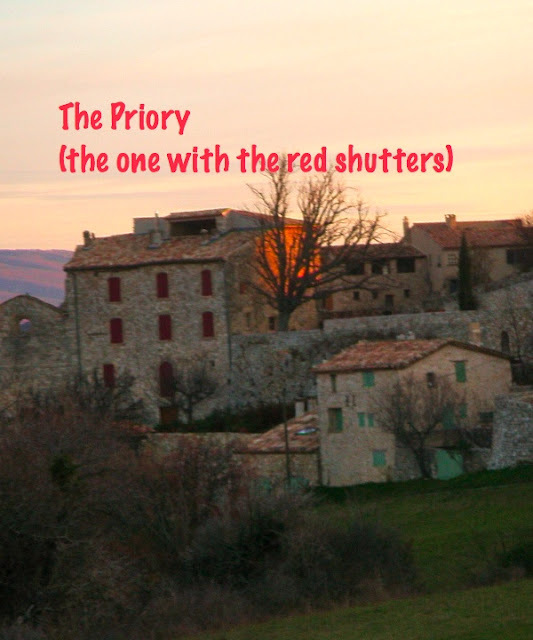 When you said priory I totally thought Pillars of the Earth! If no fair, I think this at least deserves an episode of ghost hunters! Of course, the Mother of friend who likes to live in style will actually have to live there first. Never a dull moment, wait until Fifty shows up with a femur in his mouth! Now you know where to get really awesome Halloween decorations! That is really cool! History nerd over here just got way excited. Plus, imagining Fifty dressed up like a monk make me choke on my water. Totally cool post! Next time, maybe BIL can dig up some gold Louis! I was completely unbothered by the bones - just enjoying your post and imagining myself in your quaint and ancient french village -until I read James' comment about Fifty with a femur in his mouth! Eww! Yikes! I think medievil banshees sound even scarier than NGZ! The priory looks amazing. We're headed to Provence in two weeks for 4 nights, tell me it's warm?! Yeah I hate folk who do that - ?! Bones aside, this place is absolutely gorgeous! I have been compared to a banshee before. Hello! Fellow nerd here wanting to serve as Maiden of Honor to your awesome nerdy World Famous Medieval Knights Fair! How cool would that be? My mind would only wander as far as yours (though slightly different directions) is anyone I knew were to stumble across old human remains and I would be just as excited about the prospects of National Geo coming to interview me (cause I speak English and all) about the unique finds. And more on this Nazi Ghost story?? "Sometime? ", Mon amie. Seriously, if your mind didn't wander, well, that's why I enjoy this blog. Why fly if you can't take flights of fancy. Let me know when the First World Famous Medieval Knights Fair will be held. English speaking ghosts are bad enough I would be really upset to have French speaking ghosts haunting me. La Petit Village is actually a very exciting place. I don't want anyone holding my skull 900 years from now either. I'm with you on the cremation thing. I chuckled a lot at the idea of your grandiose fair with Fifty in the monk habit. eep! bones! but that place is pretty darn gorgeous otherwise! This is SO awesome! If they were to make a yearly Medieval Knights Fair I would have absolutely attended in full costume. It's probably because I watch too much Law and Order, but I've always wanted to find a body. I guess this comes close. And the nerdy little history buff inside me is just raging with jealousy! On a side note, in Phoenix there's a little night club made out of an old church. But like, 100 years old. This would be an infinitely cooler night club! Oh I just loved Pilars of the Earth -- but I was dissapointed to see the mini series (did you see that joke?) I was also dissapointed to find out Ken Follet's other books were nothing like Pilars of the Earth. Sigh-iski, so much dissapointment from one enjoyed book. Creepy indeed! Glad those bones got re-buried, and really hope he did wash his hands :) Can't believe all the action your lil' village gets, tres cool !